CBSE Sample Papers For Class 10: The Central Board of Secondary Education (CBSE) will conduct the CBSE Class 10 Board Exam from 2nd March 2019. The Class 10 Board exams being one of the most important exams in the life of a student, everyone should take it seriously and give their best shot in the exam. The result of Class 10 determines the future of the students in terms of the stream they are going to get for their further studies. By now, students appearing for Class 10 Board Exams must have finished the entire syllabus and started their revision. At this point, practicing CBSE Sample Papers for Class 10 is of utmost importance. This will help students get an idea about the nature of the board exam and the type of questions asked in it. They will also understand their level of preparation. Based on that, they can decide their preparation strategy to improve. So, practice CBSE Class 10 Sample Papers and get familiar with the actual exam. Discover your weak areas and work on it. Boost your confidence and reduce the fear of exam. You will have a better understanding of the exam pattern, the nature of the questions asked in the exam, marking scheme, etc. You will get to know your mistakes and weaknesses, and learn from them. We have provided you with the CBSE Class 10 Sample Papers which will help you in your Class 10 board exam preparation. Practice these papers as well as CBSE Class 10 previous year papers and then analyze them to find where exactly you need to improve. Then work accordingly. Revise your weak chapters and practice more CBSE Class 10 questions from them. At Embibe, these practice questions for Science and Maths are available for free. 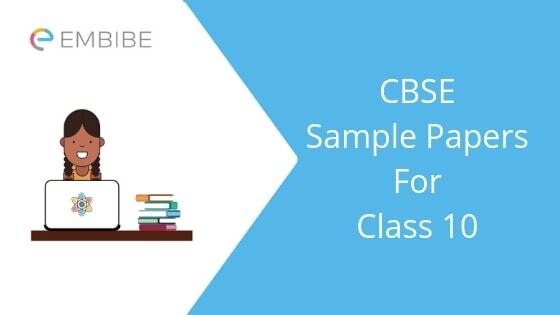 You can also take free CBSE Class 10 mock tests on Embibe for these subjects which will be extremely beneficial to you. Embibe wishes you all the very best for the upcoming CBSE Class 10 board exam. We hope this article on CBSE Sample Papers for Class 10 has helped you. If you have any question, feel free to get back to us by dropping your comments below. You can also ping us through our Live Chat Service where we are available from 10 am till 11 pm. We will be glad to help you.